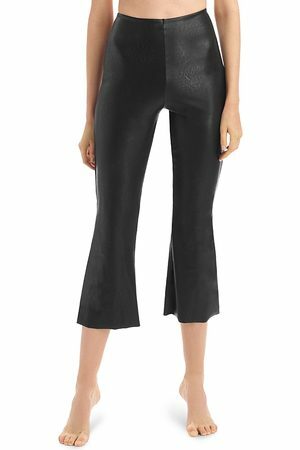 SABLYN Devon Cropped Leather Pants in . Devon Cropped Leather Pants in . Leather is on its way to be one of the top trends of the season, when will you be investing in a pair of women’s leather pants? Obviously, a pair of leather pants isn’t your traditional workwear choice but there are plenty of other ways to wear leather pants this year. If you’re going to wear a pair of (tight) leather pants pair it with a slouchy tee or a longline tunic and finish the outfit off with a denim jacket or a linen blazer. It’s probably best to avoid adding any more leather to the look so find yourself some colorful light pastel shades to wear with the combo.